Bone broth is all the rage right now! A 250mL cup will cost you around $8 and it’s actually so easy to make yourself. We have to admit, the health benefits are incredible. The whole concept of bone broth revolves around the nutrient rich gelatin found in the bones of pastured cows and free range chickens. Basically, our ancestors ate the whole animal, including the joints whereas we are predominantly muscle meat eaters now (think: chicken thigh, beef rump, lamb shanks, etc) so we are missing out on gelatin. 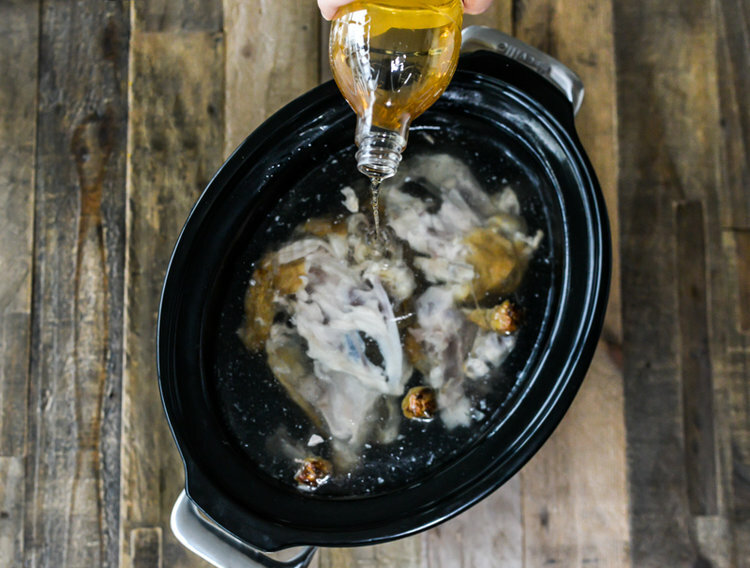 By slow cooking bones for 24+ hours, we are able to pull these valuable nutrients from the bones in the form of bone broth. 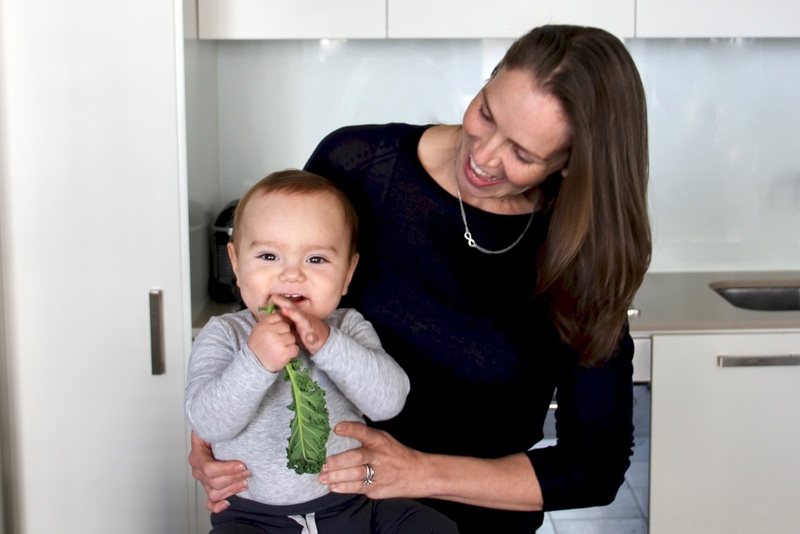 Drinking or cooking with this will give you and your family the health benefits. Gelatin is great for healing your gut lining, helping you sleep and will even improve your hair, skin and nails as well! Winning! As it is made up of a unique profile of amino acids, it is metabolised differently and will go directly to your joints to help repair any damage done over time as well. Lucky for you, there is no need to purchase an $8 cup a day! You can make it yourself by following this recipe below. Drink up! 2 frozen free range chicken carcasses (or the equivalent in bones that will fill your slow cooker – there is no set amount here). You may use grass fed beef bones as well. * Note that carrots, celery, onion and parsley can be added to give this more flavour and depth. We’re offering instructions for the bare bones (literally) option here. 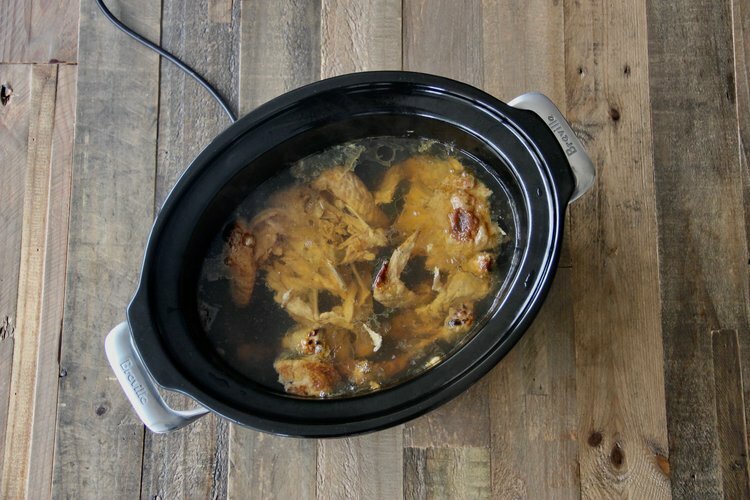 Place your frozen bones in your slow cooker and cover completely with cold water. Add the apple cider vinegar and let sit for 30 minutes. This will jumpstart the process for pulling the minerals and nutrients out of the bones. Set your slow cooker to the maximum time on low heat. The slow cooked pictured above only goes to 10 hours so we needed to keep adding time and left it in there for 48 hours. After cooking, the bones will fall apart and you’ll see the water is now cloudy (because it’s bone broth!). Use tongs to remove the large bones and discard them. We love using these glass Pyrex mixing bowls and highly recommend purchasing a set for your kitchen! Using a sieve, pour the stock through into a large mixing bowl to remove the smaller bones. Discard those as well. 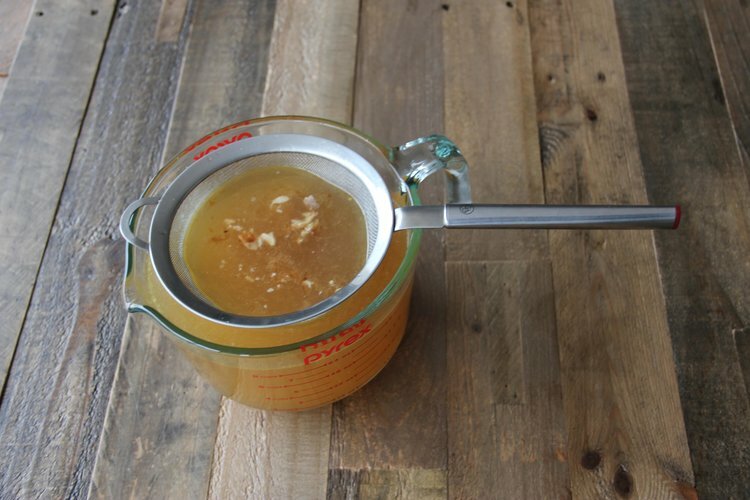 Place the bone broth in the refidgerator to allow the fat to cool at the top for easy removal. After 4 hours, remove your bone broth from the refrigerator and skim the hard layer of fat from the top. You may save this for cooking or you may discard it. 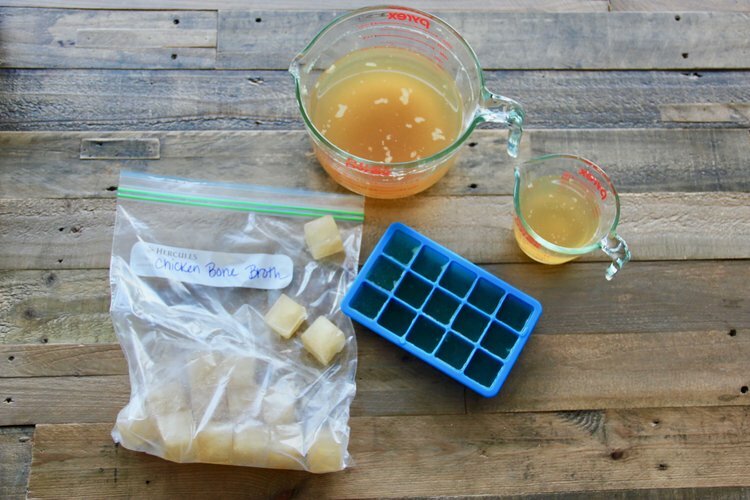 We like to freeze our bone broth in cubes so that it’s easy to use for future cooking or drinking but you may freeze however you’d like!